Why hello there, strangers (stranger? anyone?). Yeah, I’m not sure how else to start this. 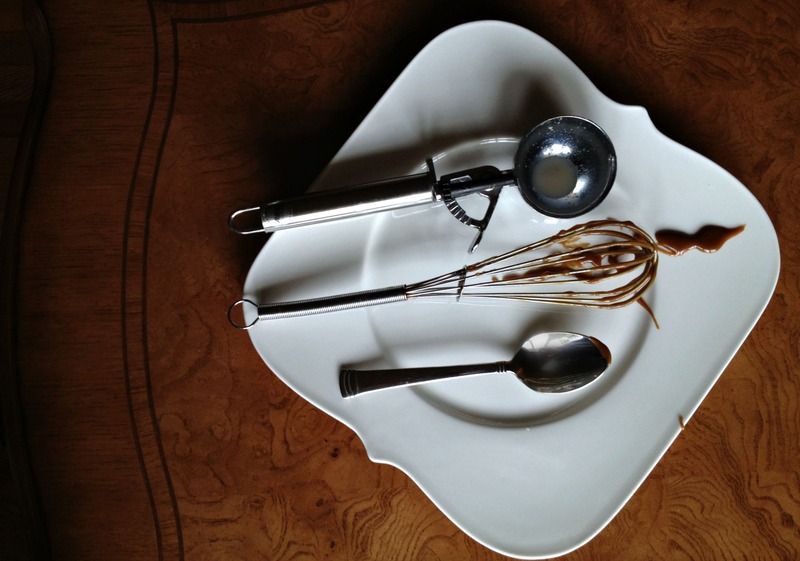 My last post –a post that meant a lot to me because I was so happy with its recipe and with baking and blogging and life — is dated August 23rd. So this is just kind of…awkward. The past month was certainly not the most difficult I’ve experienced, but it did feel very empty. To make a long story short, I took a break from cooking and blogging to move into a new apartment, get that kitchen settled. Four weeks later, I broke my lease due to apartment troubles and I am now, once again, looking furiously for a new place. Missing late-summer days at the farmers’ markets, the change in the air, the turning of the leaves, the peak apple-picking (and not to mention apple cider donut–eating) season, my daily blog-reading and cookbook perusing ritual was unfortunate but not crippling. There will be another late summer and another early fall. Instead, those days were so grey because my hands were painfully idle. Yes, they were busy typing and cleaning and tending and mending. But they were not kneading or folding or tossing or whisking. They had no access to the rough skins of fresh ingredients, to the stove’s flame and the oven’s heat. It was the longest they had gone without lifting a knife or grasping a smooth wooden spoon. They didn’t have the time, the energy, the resources as they were needed to put out fires. I guess I can look at the whole scenario as confirmation of what I love. When you love something, there are ups and downs, but you can’t live without it. And in that time without it, I did feel frozen. My diet was so mundanely lean, as was my life. Lean. Empty of richness, of body. Each time I flicked on the gas, just to set the tea kettle aboil, I listened to the spark. I studied the noise. I wanted that flame to be heating fat in pan — to be a starting place for sizzling onion and cracking garlic. To be an aroma-starter, a melter, a smoker. But it merely boiled. Boiled and boiled until I was awash in tea. It was the only thing to bring comfort. It was warm. The only thing I consumed that was truly warm. Eventually I brought myself to blanch — more boiling, essentially. But I blanched when I really wanted to roast, I boiled when I really wanted to sauté. So, to avoid homelessness, I am temporarily boarding chez my parents. There, I’ve gained access to oven and fridge and counter and stove. There are so many things I want to start attacking, so many recipes that have gone through my head in that month. I started developing one, a pie (of course), when its star was out of season last spring. It needs to be tested again before I can share; this process should have started weeks ago. There’s one that’s my go-to fall supper and one that’s so out of the realm of what I usually do, that I’m excited to hop to it. I’ll just have to be patient. These will hopefully come in time. I need to learn again. I need to get my hands used to being active in this realm again. So I made something simple. Something that only needs stove and pot and whisk and spoon. And I can’t say I made it for you. I only made it for me. I stole some time and made exactly what I craved at that moment, using only ingredients I already had with the only tools that weren’t in boxes. I wanted something warm. I wanted something luscious. I saw butter pecan in the freezer. It wasn’t my butter pecan, it was Haagen Dazs’s. But when you’re tired, stressed, and your ice cream machine is god only knows where, Dazs will do. Especially with a warm topping. And booze helps. Salted caramel? Been there done that oh so many times. Hot fudge? 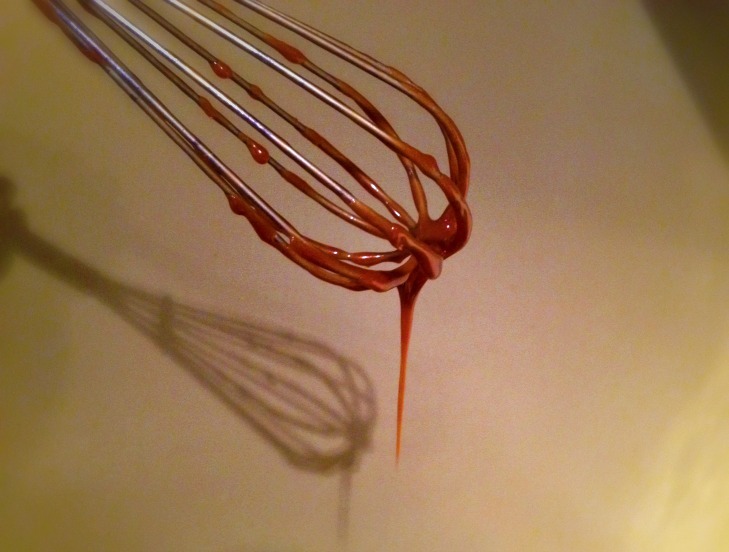 Bittersweet chocolate sauce? Yawn. I wanted to go back to a comforting classic and kick it up a little. So that was where Bourbon Butterscotch Sauce came from. 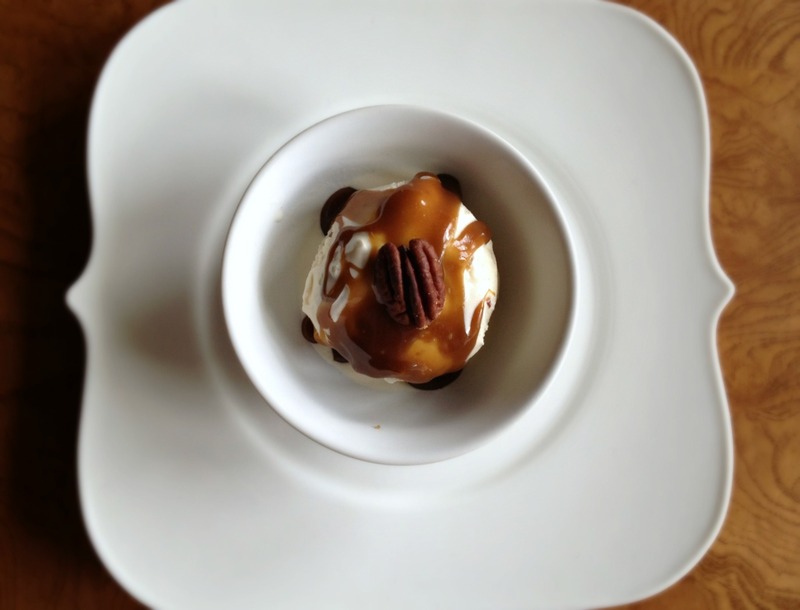 Growing up, my mother would always reminisce about the “hot butterscotch sundaes” of her youth as I happily downed my caramel or hot fudge ones (in my house, always with peanuts). Places that serve, er, real ice cream and toppings, though, typically don’t offer butterscotch, so I assumed I didn’t like it as the jarred varieties were frightfully pale and cloying. And don’t get me started on butterscotch chips—I’m not going to veil the fact that I think they’re vile. But true, rich butterscotch flavor comes from the browning of the proteins in butter and cream and the caramelization of brown sugars. The science is different than that of caramel, but I won’t bore you. The point is, butterscotch is a related but different animal. I thought about doing a spicy butterscotch, like the one from Toscanini’s, but the bourbon was calling to me. In the end, I got a delightful sauce with a texture that wasn’t thick and gloppy like commercial versions but that wasn’t as thin and runny as your average caramel sauce. It had a round, full flavor, with a unique sweetness from the bourbon. It was a sign that I was ready to return to the kitchen. I wanted to take my gorgeous sundae goblets and fill them with alternating layers of ice cream, toasted nuts, and sauce. But I’m not ready for it yet. The only photo you get is of the honest serving that I had when I first tasted it. Subsequent servings were even less artfully plated. But they did the trick. Wow, I’m feeling chatty. That felt good. For me, the level of bourbon in this sauce is perfect; after making it a few times, I found that more bourbon added in the last minutes of cooking had a better flavor than less added at the very end. While you can increase or decrease the bourbon to your taste, you can also omit it completely. 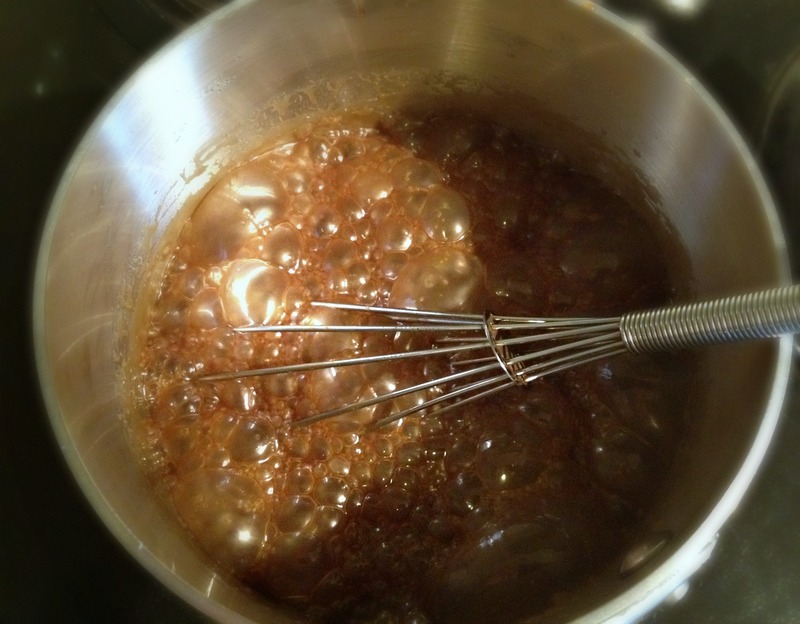 This will be a true butterscotch flavor, which I enjoy as well and which will also be a part of my repertoire. 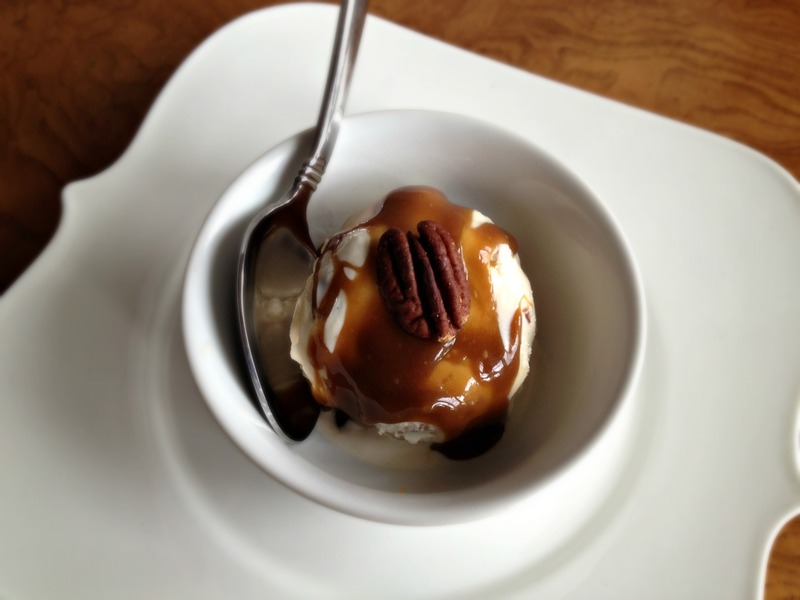 Butter pecan is the perfect base for the sauce, but it would also be delicious on vanilla or even coffee ice cream. Do not cook sauce beyond the temperature suggested; this will result in a sauce that turns hard as soon as it lands on the cold ice cream. 2. Add cream and whisk to fully combine. Turn heat to medium-low and cook, whisking occasionally, until mixture registers 225 degrees. Add bourbon, vanilla, and lemon juice. Continue cooking, whisking, until mixture registers 230 degrees. Remove from heat and transfer to airtight container. Use hot, warm, or room temperature depending on preference. Cool to room temperature before storing. Butterscotch will keep for 2 weeks in refrigerate. Rewarm in bowl set over saucepan of gently simmering water or in a small pan over low heat. Welcome back! And what a lovely recipe to return with. Who cares if it’s fairly simple and not an all-singing, all-dancing sundae? It’s real food and full of gorgeous butterscotch bourbon flavour and totally on my ‘to make’ list! I know you’re a fellow ice cream fanatic, so you can definitely relate :). You’re back! Yay :) I don’t think I’ve ever had a butterscotch sundae. Need to remedy that soon. Good luck with the apartment hunt! I know how you feel about the idle hands. I’ve basically been on a 6-month hiatus from truly baking and cooking, and I hate it. But we’re closing on our house next week, so there’s light in the distant future! I hope the apt search is going well! eugh, apartment searching is no fun, and having to do it again… i’m sorry! i moved in august too, and it made it so hard to enjoy the seasons. glad you’re back at it though, and this sounds absolutely delicious. might have skipped the ice cream and dug right in with a spoon!